Around 300 officers and 14 coastguard ships are patrolling the coastline after packets of narcotics were found in several locations since Friday. Police have urged members of the public to not open the parcels. 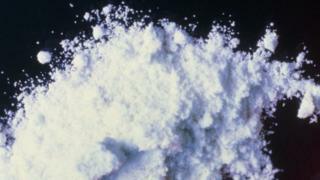 Romania is said to be part of a drugs transit route connecting Latin America and Europe. The packets are thought to be part of a shipment of an estimated tonne of cocaine that was found in an abandoned ship just over two weeks ago. Two Serbian men were arrested in connection with the discovery. On Sunday, police confirmed that two helicopters, several boats and divers were also taking part in the search. Romanian broadcaster Digi24 reported that the operation covered about 90km (55 miles) of coastline. Police spokesman Georgian Dragan warned people not to open parcels they found on the beach. He told local media: "These drugs have a high concentration, more than 90%, and could pose a threat to life." In 2016, Romanian police seized 2.5 tons of cocaine worth at least €600m (£516m). The cocaine, destined for the Netherlands, was hidden inside banana containers.